BUT THE END IS DRAWING NEAR FOR 2018. 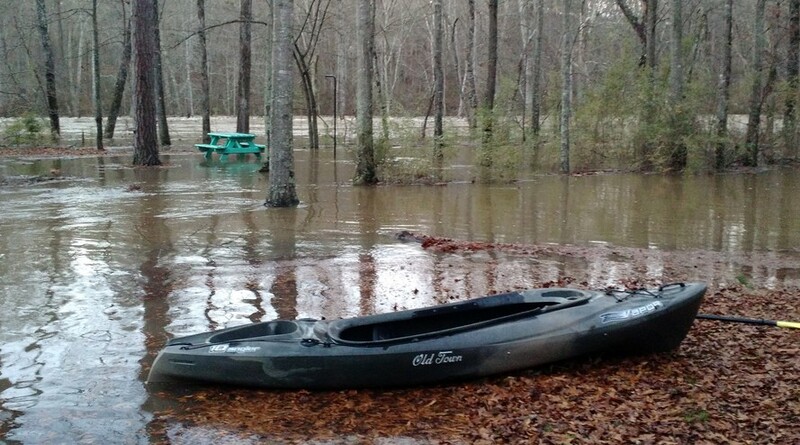 December 28, 2015 -- The Cadron hits a new high -- 22 feet (15,000 cfs) -- and puts Eleven Acre Island and Pinnacle Springs Campground under water. Campsite #1 seen here on the "high side" of the island could still be approached by boat while rushing waters on the upper side of the island carried picnic tables and benches into the treetops -- all were recovered and damage was slight. March 1, 2019 -- In our earliest opening ever Cadron Creek Outfitters opens for the 2019 Paddling Season. We will be open Friday from noon to sunset and Saturday and Sunday from 8:00 am to 7:00 pm -- and during the weekday by reservation. As the 2018 paddling season dwindled to a close long before Memorial Day we're hoping the rain gods will look down upon us next year. Shannon: Really like the new store and all the improvements -- the place looks wonderful. But when are you going to replace that old beat up van? Cadron Boy: Well we purchased a "newer" 15 person passenger van last spring. Air-condition and sound! Put it to the test in a 3000 mile plus trip out to Wyoming last summer to paddle the Little Bighorn. It's delightful and a real hoss when it comes to climbing bluffs! Bob: Is the fishing any good? Cadron Boy: That's a question I am reluctant to answer, but I think I can do so without letting go of any secrets. First, the Cadron is a rich fishery -- on the right day with the right bait/lure you can catch hundreds of fish. Reminds me of the Middle Fork of the Little Red. Many of the fish will be small -- mostly bream (bluegills and longear sunfish) -- but there are a lot of Kentucky black bass to satisfy the best of anglers. And those who are wise to the ways of the Cadron can find large catfish (5-20 pounds), large schools of crappie, and tail-walking largemouths of 3-5 pounds. All it takes is a cane pole, hook, bobber, string and a few crickets for a young child to spend an afternoon squealing and laughing..
Bob: Are there any small-mouth bass? Cadron Boy: No there aren't any smallmouth on the Cadron -- probably because of a general lack of gravel and natural sedimentation arising from Muddy Creek on the East Fork of the Cadron. Now I prefer the clean taste of a Cadron bluegill but when I get a hankering to catch a smallie I don't have to drive far as both the South and Archey Fork of the Little Red have a fair number of smallmouth. Using Pinnacle Springs campground as your base you can also enjoy fishing for record-breaking trout -- rainbows and brown -- on nearby Little Red River. Did you know Cadron Creek OUtfitters offers over a 100 miles of Ozark wilderness streams to it's clients? The North Fork of the Cadron may be home but we also lead, source, assist and shuttle trips on the Middle and East Forks of the Cadron, Cove Creek, Choctaw Creek, Hogan Creek, South and Archey Forks of the Little Red River, East Fork of Point Remove Creek and Greers Ferry Lake. It is hard to look over our campground today and find signs of its rich history -- the Native American encampments and food plots, the terraces built by freed slaves, the Cargile homestead and outbuildings are chiefly lost to the passage of time. Even the chalybeate springs from which the campground gets its name no longer are sought out for their healing properties. Fortunately some people have not forgotten our past and we get a lot of requests for information regarding Pinnacle Springs, the "ghost resort" that was home to several bath houses, a large hotel, college and several businesses in the late 1800s. As you paddle downstrean of Pinnacle Springs campground you will pass by the old ferry landing and the two-acre city park that once graced the ridgeline overlooking the creek. The principal spring is only a few steps away from the river (photo right) but unless you know the spot you'll likely float right by it never knowing that once hundreds of people visited the spring each summer to drink its healing water. 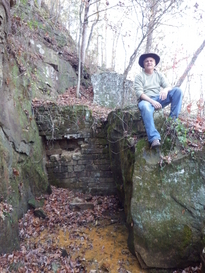 For those wanting to know more about the Pinnacle Springs -- a heritage monument in our eyes -- please download the Word file or stop by and visit with Cadron Boy.